Top: A firestorm erupted after Islamist Watch broke the story about Best Buy's "platinum sponsorship" of Hamas-linked CAIR. Bottom, from left: Secretary of State Clinton allows Muslim Brotherhood officials into America through the front door and ties the hands of border agents; Democratic National Committee Chair Debbie Wasserman-Schultz didn't have a problem giving a keynote address at a fundraiser hosted by an Islamist on the Terrorist Watch List – until it was discovered by her opponent; What are your children learning about Islam in public school? Parents might be shocked. 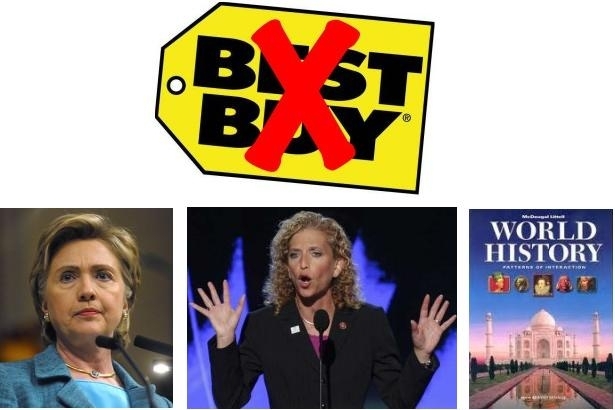 On April 17th, Islamist Watch (IW) broke the story about Best Buy's "Platinum Sponsorship" of the annual fundraising banquet in Minnesota for the Council on American-Islamic Relations (CAIR), a group the United States Government has linked to Hamas and the Muslim Brotherhood. Subscribers to the Islamist Watch email list flooded Best Buy with protests and the story went viral. Facebook "likes" are 2,715 and counting. Best Buy, in the midst of a power-vacuum as they search for a new CEO, continues their refusal to rule out future support for CAIR. "Best Buy: Electronics and Hamas, Best Buy is a 'Platinum Sponsor' of the Council on American-Islamic Relations (CAIR), an organization with links to Hamas," by Rachel Hirshfeld. Artuz Sheva – Israel National News, April 25, 2012. A Facebook protest page has appeared, "Boycott BEST BUY until they STOP using profits to finance Islamic Radicals." Although Best Buy has not backed down on their support for CAIR, they did go to the trouble of filing a complaint with Facebook over the use of Best Buy graphics used on the protest page. Those graphics, including a "Jihad Squad" logo meant to parody Best Buy's "Geek Squad," were quickly removed by Facebook. Our friends up north should know that the Canadian retailer "Future Shop" is wholly-owned by Best Buy.